Israeli forces killed 4 Palestinian civilians, including 2 children, in the West Bank. 221 civilians were wounded in Jerusalem and its suburbs, 19 were wounded in the West Bank and 19 others were wounded in the Gaza Strip. Israeli forces continued to target the Gaza Strip border areas with no casualties reported. A checkpoint belonging to the Palestinian armed groups in the central Gaza Strip, causing material damages to the checkpoint and a nearby house. Israeli forces conducted 81 incursions into Palestinian communities in the West Bank and 3 limited ones in the Gaza Strip. 128 civilians, including 14 children and 4 women, were arrested. 51 of them, including 5 children and a woman, were arrested in Jerusalem. Among those arrested was a Palestinian Legislative Council (PLC) Member and Former Finance Minister, Dr. ‘Omer ‘Abdel Razeq. 11 civilians, including a child and girl, were arrested at military checkpoints in the West Bank. Among those arrested was writer Sa’id Media and activist ‘Abdullah Abu Rahmah. Israeli violations of international law and international humanitarian law in the oPt continued during the reporting period (20 – 26 July 2017). In the West Bank, on 14 July 2017, in excessive use of force, Israeli forces killed Mohammed al-Teneh (24) from Taqou’a village, east of Bethlehem, after he was shot near the northern entrance to the village. The Israeli forces claimed that al-Teneh attempted to carry out a stab attack, but eyewitnesses in the scene emphasized they did not see any sharp tool beside his body lying on the ground. Following the Friday prayer, 21 July 2017, most of occupied East Jerusalem’s neighbourhoods and villages witnessed violent clashes between the worshippers and Israeli soldiers. Those clashes continued until the afternoon, resulting in the killing of 3 Palestinian civilians, including 2 children; one of whom was shot dead by an Israeli settler. In Ras al-‘Amoud neighbourhood, east of the City, Mohammed Sharaf (17) was shot dead when a settler opened fire at him. Sharaf was hit with 2 bullets to his neck. In al-Tur neighbourhood, east of the City as well, Mohammed Abu Ghannam (20) was shot dead when Israeli soldiers opened fire at him from a close distance, wounding him to the chest and heart. In Abu Dis, east of the City, Mohammed Lafi (17) was hit with bullets to his chest, one of which directly hit his heart. In the Gaza Strip, the border area witnessed peaceful protests against the illegal closure imposed on the Gaza Strip. Israeli forces used force against the protestors. As a result, 19 Palestinian civilians, including 2 children and 2 paramedics, were wounded. Two of them were hit with live bullets and 17 were directly hit tear gas canisters and sound bombs. In the context of opening fire at the border area, on 23 July 2017, Israeli forces fired two artillery shells at a checkpoint belonging to the Palestinian armed groups, southeast of Deir al-Balah in the central Gaza Strip. As a result, the checkpoint and a nearby house sustained damages. On 26 July 2017, Israeli forces stationed east of Jabalia in the northern Gaza Strip opened fire at the area adjacent to the border fence between the Gaza Strip and Israel. Neither casualties nor damages were reported. Concerning attacks on fishermen, on 24 July 2017, Israeli gunboats sporadically opened fire at the Palestinian fishermen, northwest of Beit Lahia village, north of the Gaza Strip, and chased them. However, neither casualties nor material damage were reported. A similar attack recurred against the Palestinian fishing boats in the same area on 25 and 26 July 2017. During the reporting period, Israeli forces conducted at least 81 military incursions into Palestinian communities in the West Bank, and 8 limited ones in the Gaza Strip. During these incursions, Israeli forces arrested at least 128 Palestinian civilians, including 14 children and 4 women. Fifty-one of them, including 5 children and a woman, were arrested in occupied Jerusalem and its suburbs. Four civilians, including 3 children, were arrested during protests. Among those arrested were PLC Member of the Change and Reform bloc (Hamas) and former Finance Minister, Dr. ‘Omer ‘Abdel Razeq; writer and journalist Mohammed Sa’id Medyah (83) from Halhoul, north of Hebron; and Coordinator of the Popular Committee against the Wall and Settlement, ‘Abdullah Abu Rahmah (46). On 26 July 2017, Israeli forces moved 100 meters into the south-eastern side of Beit Hanoun, north of the Gaza Strip, and levelled and combed areas there. For the second week, the Israeli authorities continued to escalate the measures taken against al-Aqsa Mosque in occupied Jerusalem. Those measures included closing the Mosque; banning prayers; and establishing metal detector gates at its Gates. On Sunday morning, 16 July 2017, these authorities established metal detector gates at 9 gates of al-Aqsa; 5 were in the yard of the Lions’ Gate “al-Asbat”, 2 in the Council Gate “al-Majles”, and 2 in the Chain Gate “al-Silselah”. Meanwhile, the Gates of Remission “Huttah”, King Faisal, Bani Ghanim “al-Ghawanmah”, Iron “al-Hdaid”, Ablution “al-Mutaharah”, and Cotton Merchants “al-Qattanin” are so far closed. Since then, the Palestinian worshippers has refused to enter al-Aqsa Mosque through these detector gates and started performing prayers in the yards at the entrances to the Noble Sanctuary. Despite the demands to remove these gates, the Israeli Cabinet in the Israeli government decided in its meeting on Thursday, 20 July 2017, to maintain these detector gates; amass more forces to Jerusalem, its surroundings and al-Aqsa Mosque; impose a tightened closure on Jerusalem; and close all roads and entrances to and from the city. On 23 July 2017, Israeli forces installed surveillance cameras, overhead metal brdiges and railings at the entrances to the Lion’s Gate in addition to the metal detectors. On 25 July 2017, the Israeli forces removed the metal detectors and declared its intention to remove all the cameras, overhead bridges and surveillances cameras installed in the previous days at al-Aqsa Mosque entrances to restore the situation before 14 July. At approximately 01:00, Israeli forces moved into Ethna village, west of Hebron, and stationed in the western area. They raided and searched a house belonging to Ahmed Abed al-Rasoul Bashir (28) and then arrested him. Around the same time, Israeli forces moved into al-Fawar refugee camp, south of Hebron. They raided and searched a house belonging to Ibrahim ‘Ali al-Husaini (22). At approximately 02:30, Israeli forces moved into the southern area in Hebron, and stationed in al-Ja’bari neighborhood. They raided and searched a house belonging to Hamzah Sami Eshaq al-Ja’bari (22) and then arrested him. Around the same time, Israeli forces moved into Salem village, northeast of Nablus. They raided and searched several houses and then arrested Mohammed Mustafa Hamdan Salem (22). At approximately 03:00, Israeli forces moved into Yatta, south of Hebron, and stationed in Roq’ah area, west of the city. They raided and searched 2 houses belonging to Saddam Majed Zain (38) and Abdul Karim Nayef Zain (28) and then arrested them. They also raided and searched a lathe workshop belonging to Zain family and confiscated some machines from it. Around the same time, Israeli forces moved into Deir Sharaf village, northwest of Nablus. They raided and searched several houses after which they arrested Ward Netham ‘Antari (20). Around the same time, Israeli forces moved into Saida village, north of Tulkarm. They raided and searched several houses and then arrested Mo’men Nawaf Raddad (25). At approximately 13:40, in a new crime of excessive use of force, Israeli forces killed Mohammed Husain al-Teneh (24) from Taqou’ village, east of Bethlehem after shooting him near the northern entrance to the village. They claimed that Mohammed attempted to carry out a stab attack, but eyewitnesses, who were in the area, confirmed that they did not see any sharp tool on the ground. The soldiers attempted to prevent the village residents from reaching Mohammed by firing live bullets, sound bombs and tear gas canisters in the air. Mohammed’s body was taken to an Israeli jeep. Photos taken of the body, showed that Mohammed sustained several live bullet wounds to the head and chest as part of the brain was on the ground. At approximately 23:15, Israeli forces moved into Rafat village, west of Salfit. They raided and searched a house belonging to Anas Khaled Sharif ‘Ayash (22) and then arrested him. Note: During the aforementioned day, Israeli forces conducted (6) incursions in the following areas and no arrests were reported: Kharas, Taffouh, al-Thaheriyah, Deir al-‘Asal and Deir Samet villages in Hebron, and ‘Azoun village, east of Qalqiliyah. At approximately 01:30, Israeli forces accompanied with 12 military jeeps moved into Taqou’, east of Bethlehem, from the northern and western entrances, and then stationed in al-Sabah, al-‘Amour, Al-Teneh and al-Deir neighborhoods. They raided and searched a house belonging to the family of Mohammed Husain al-Teneh, who was killed at the northern entrance to the villages in the previous day. The soldiers ripped off Mohammed’s photos and damaged the contents of the condolences house. They also handed the family a threat notice signed by Israeli forces ordering them” not to commit any terrorist acts which violate the law”. Moreover, the soldiers raided and searched a house belonging to Mahmoud Mohammed al-‘Amour and withdrew in the morning, but no arrests were reported. Note: During the aforementioned day, Israeli forces conducted (4) incursions in the following areas and no arrests were reported: Hebron, Dura, Qalqas and Beit Ummer villages in Hebron. At approximately 02:30, Israeli forces moved into Taqou’ village, east of Bethlehem. They raided and searched a house belonging to Mahmoud Husain al-‘Amour (25) and then arrested him. At approximately 03:30, Israeli forces moved into Jenin. They raided and searched a number of houses after which they arrested Abdul Salam Jamal Abu al-Haijaa’ (36) and Ghassan Abdul Wahab Zaghibi (44). Note: During the aforementioned day, Israeli forces conducted (3) incursions in the following areas and no arrests were reported: Dura, Beit Awla and al-Burj villages in Hebron. At approximately 00:00, Israeli forces accompanied with 4 military bulldozers moved about 100 meters into the west of the border fence between the Gaza Strip and Israel, east of al-Buraij in the central Gaza Strip. They leveled the lands adjacent to the abovementioned border fence. The incursion continued for 3 hours after which the Israeli forces redeployed along the border fence. At approximately 01:00, Israeli forces moved into several neighborhoods in Hebron. They raided and searched a number of houses after which they arrested 5 civilians namely Nedal Mohammed Abu Suneinah (44), Hazem Mohammed Zablah (32), Mohammed Salah Bader (38), Ahmed ‘Ali al-‘Oweiwi (24) and Nouh Yusri al-Hashlamoun (28). Around the same time, Israeli forces moved into Beit Ummer village, north of Hebron. They raided and searched a house belonging to ‘Arafat ‘Essa al-Za’aqiq, and Mohammed Moneer Redwan Ekhleil (37) and then arrested them. Around the same time, Israeli moved into Ethna villages, west of Hebron. They raided and searched a house belonging to Isma’il Talab Ahmed Natlah (37) and then arrested him. Around the same time, Israeli forces moved into Bethlehem. They raided and searched a house belonging to Jamil Ya’qoub Salamah Qamsiyah (75) and then arrested him. At approximately 01:30, Israeli forces moved into Nablus. They raided and searched several houses after which they arrested Omer Abdul Rahim al-Hanbali (46) and Nidal ‘Ali Abu Ramilah (45). At approximately 02:00, Israeli forces moved into ‘Ourta village, southeast of Nablus. They raided and searched a number of houses and then arrested ‘Ali As’ad Laulah (34). Around the same time, Israeli forces moved into Madama village, south of Nablus. They raided and searched several houses and then arrested Mahmoud Wajih Kamel Qet (23). Around the same time, Israeli forces accompanied with 15 military jeeps and an infantry forrce moved into Qalqiliyah. They raided and searched several houses after which they arrested 5 civilians namely Mos’ab Omer ‘Atiyah (21), his brother Mo’ath (25), Mohammed Bilal Farij (28), Abdul Naser ‘Ali al-Rabi (45) and Mohammed Hashem Abu Khader (45). It should be noted that last three civilians were former prisoners and released before only a short period. Around the same time, Israeli forces moved into Halhoul and stationed in al-Tharwah area. They raided and searched a house belonging to ‘Ali Abdul Mohsen Zama’arah (33) and then arrested him. Around the same time, Israeli forces moved into al-Khader village, south of Bethlehem. They raided and searched a house belonging to Walid Khader Salah (27) and then arrested him. At approximately 02:30, Israeli forces moved into Tubas. They raided and searched several houses after which they arrested Ashraf Mustafa Daraghmah (38). Around the same time, Israeli forces moved into Salfit. They raided and searched a house belonging to Dr. Omer Abdul Razeq Matar (53), a PLC Member representing the Change and Reform Bloc of Hamas Movement and former Minister of Finance in the tenth Palestinian government, and then arrested him. At approximately 06:00, they withdrew taking him to an unknown destination. It should be noted that Matar was arrested 6 times before by the Israeli forces and served 7 years in prison; the last of which was for 9 months. Around the same time, Israeli forces moved into Hendazah area, east of Bethlehem. They raided and searched a house belonging to Nader Khader Mohammed ‘Obeidullah and then arrested him. At approximately 03:00, Israeli forces moved into Jenin. They raided and searched several houses after which they arrested Khaled Mohammed Amin al-Haj (50). At approximately 03:30, Israeli forces moved into al-‘Arouj village, east of Bethlehem. They raided and searched a house belonging to Ja’far Abdullah al-‘Arouj (24) after which they arrested him. At approximately 04:00, Israeli forces moved into Sa’ir village, east of Hebron, and stationed in al-Kawazbeh area. They raided and searched a house belonging to Yunis Ahmed Kawazbeh (55) and then arrested him. At approximately 17:30, Hekmat Jawdat Sa’id Hamed (26), from Furoush Beit Dagan village adjacent to al-Hamra checkpoint in the central Jordanian Valley, was driving his car on the main street. An Israeli military jeep chased him, so he fled away to the agricultural lands. The soldiers chased him and ordered him to stop, but he did not respond. When he travelled away from them, he left the car and ran away. The soldiers continued to chase him, and one of them opened fire at him. As a result, he was hit with live bullet to the right foot. The soldiers took him to al-Hamrah checkpoint. 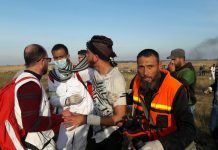 In the meantime, an ambulance of Palestine Red Crescent Society (PRCS) arrived from the center of Tubas and offered first aid to Hekmat at the abovementioned checkpoint. The Israeli forces did not allow the ambulance crews to evacuate him from the area until approximately 19:30, as he was arrested from the ambulance and taken to “Jadi” military camp in al-Jiftlik. At approximately 20:30 on the same day, The Israeli forces coordinated with the Palestinian Military Liaison to hand over the wounded civilian and transfer him to a Palestinian hospital. Note: During the aforementioned day, Israeli forces conducted (5) incursions in the following areas and no arrests were reported: al-Samoa’ and Surif villages in Hebron; Howarah and Beta villages in Hebron, and Kafer al-Deek village, west of Salfit. At approximately 00:00, Israeli forces moved into al-Khader village, south of Bethlehem. They raided and searched a house belonging to Ahmed ‘Ali ‘Essa (31) and then arrested him. At approximately 01:00, Israeli forces moved into Taqou’ village, east of Bethlehem. They raided and searched a house belonging to Husain Mohammed al-‘Amour (17) and then arrested him. At approximately 01:30, Israeli forces fired 2 artillery shells at a military checkpoint belonging to the Palestinian armed groups, southeast of Deir al-Balah in the central Gaza Strip. The shelling caused damage to the targeted checkpoint in addition to a house belonging to Mervat Mohammed al-Wazir. The house, which sustained partial damage, is about 70 meters to the east of the abovementioned checkpoint. Moreover, the house inhabitants panicked. At approximately 02:00, Israeli forces moved into Abu Katilah neighborhood in the southern area in Hebron. They raided and searched a house belonging to Abdullah ‘Ali al-Junaidi (30) and handed him a summons to refer to the Israeli Intelligence Service in “Gush Etzion” settlement complex, south of Bethlehem. At approximately 02:30, Israeli forces moved into Nablus to carry out an arrest campaign against Palestinian civilians. A number of youngsters gathered and threw stones at the Israeli forces, who immediately fired tear gas canisters, sound bombs and metal bullets at them. As a result, a 17-year-old civilian sustained a metal bullet wound to the lower jaw and was taken to Rafidia Governmental Hospital to receive medical treatment. Moreover, they raided and searched several houses on al-Sekkah Street after which they arrested Hanan Khamis Mustafa Abu Seriyah (50) and her son Khamis ‘Adnan Mohammed Abu Seriyah (19). At approximately 03:00, Israeli forces moved into Husan village, west of Bethlehem. They raided and searched a house belonging to Ahmed Mohammed Hamamrah (37) and then arrested him. At approximately 03:30, Israeli forces moved into al-Dawha village and al-Dheisheh refugee camp, south of Bethlehem. They raided and searched a number of houses after which they arrested Mohannad Fehmi Qawar and Emad ‘Oudah Abu ‘Ajamiyah. At approximately 07:00, Israeli gunboats stationed offshore, northwest of Beit Lahia in the northern Gaza Strip, opened fire at Palestinian fishing boats sailing within 3 nautical miles and chased them. As a result, the fishermen were forced to flee fearing for their lives, but neither casualties nor material damage were reported. Note: During the aforementioned day, Israeli forces conducted (3) incursions in the following areas and no arrests were reported: Halhoul and Kharsa village in Hebron; and Beta village, southeast of Nablus. Around the same time, Israeli forces moved into Kuber village, northeast of Ramallah. They raided and searched a number of houses and then arrested 3 civilians, including a women, namely Ebtesam al-‘Abed (46), mother of Omer al-‘Abed, who was arrested by the Israeli forces and accused of carrying out a stab attack in “Halamish” settlement, ‘Ammar Abdul Men’em Zebar (23) and Soheib al-Barghuthi (20). At approximately 01:30, Israeli forces moved into Nablus to carry out an arrest campaign. A number of youngsters gathered and threw stones and Molotov cocktail at the Israeli forces, who immediately fired live and metal bullets and sound bombs at them. As a result, a 16-year-old civilian sustained a metal bullet wound to the neck, and a 20-year-old civilian sustained a live bullet wound to the right shoulder. The Israeli forces also raided and searched a house belonging to Raja’i Omer al-Qanneh (25) and then arrested him. Around the same time, Israeli forces moved into Beit Eba village, west of Nablus. They raided and searched a house belonging to Khaled Ahmed Abu Namous (26) and the arrested him. At approximately 02:00, Israeli forces moved into Taqou’ village, east of Bethlehem. They raided and searched a number of houses after which they arrested Mousa Mohammed al-‘Amour (17) and ‘Odai ‘Ezzat al-‘Amour (17). Around the same time, Israeli forces move into ‘Ein al-sultan refugee camp, west of Jericho. They raided and searched a house belonging to Montaser Mohammed Abu Zaid (18) and then arrested him. At approximately 02:30, Israeli forces moved into Qalqiliyah. They raided and searched a house belonging to Ahmed Mohammed Ahmed Khatib (55) after which they arrested him and his son Mahdi (24). At approximately 03:00, Israeli force moved into Beit Fajjar village, south of Bethlehem. They raided and searched several houses after which they arrested Laith Samir Deriyah (17) and ‘Odai Maher Thawabtah (17). Around the same time, Israeli forces moved into Jenin and its camp. They raided and searched several houses after which they arrested 3 civilians namely Ghassan ‘Abed al-Wahab Zaghibi (45), Mohammed ‘Ali Salem Jamahnah (25) and Mohammed Yusuf Manasrah (21). Zaghibi family said to PCHR’s fieldworker that the Israeli forces confiscated aroundNIS 20,000 while searching the house. Around the same time, Israeli forces moved into Tal village, southwest of Nablus. They raided and searched a house belonging to Qatibah Tayseer Mohammed ‘Asidah (20) and then arrested him. At approximately 04:00, Israeli forces moved into al-Dheisheh refugee camp, south of Bethlehem. they raided and searched a house belonging to Abdul Hadi Akram Mannaa’ (20) and then arrested him. At approximately 06:00, Israeli gunboats stationed offshore, northwest of Beit Lahia in the northern Gaza strip, opened fire at Palestinian fishing boats sailing within 3 nautical miles and chased them. As a result, the fishermen were forced to flee fearing for their lives, but neither casualties nor material damage were reported. At approximately 07:30, Israeli forces accompanied with several military bulldozers moved about 100 meters into the east of al-Qararah village, northeast of Khan Yunis in the southern Gaza Strip. The bulldozers leveled the lands adjacent to the border fence between the Gaza Strip and Israel. The incursion continued for several hours after which the Israeli forces redeployed along the abovementioned border fence. At approximately 10:00, Israeli forces arrested Abed Khalil Zedan (22) from al-‘Aroub refugee camp, south of Hebron after he referred to the Israeli Intelligence Service in “Gush Etzion” settlement complex, south of Bethlehem. Note: During the aforementioned day, Israeli forces conducted (4) incursions in the following areas and no arrests were reported: Beit Awla, Dura and al-Maj villages and Hebron. At approximately 01:00, Israeli forces moved into Qabatiya village, south of Jenin. They raided and searched several houses and then arrested 3 civilians namely Yusuf Namer Khazimiyah (60), his son ‘Alaa’ (24) and Haitham Ahmed Reda Turkman (22). Around the same time, Israeli forces moved into al-Fawar refugee camp, south of Hebron. They raided and searched a house belonging to Yaman ‘Ali Khashan (30) and then arrested him. At approximately 02:00, Israeli forces moved into ‘Asker new and old refugee camps, northeast of Nablus. They raided and searched a house belonging to Mohammed Hasan Ahmed Qatanani (18) and then arrested him. At approximately 03:00, Israeli forces moved into ‘Oyoun Abu Saif village, south of Dura, southwest of Hebron. They raided and searched a house belonging to Sabrin Walid Abu Sharar (25) and then arrested her. Around the same time, Israeli forces moved into al-‘Asja village, east of Dura, southwest of Hebron. They raided and searched a house belonging to Thaer Jehad Abu Sondos (35) and then arrested him. Around the same time, Israeli forces moved into Surif village, northwest of Hebron. They raided and searched a house belonging to Omer Mohammed Ghuneimat (28) and then arrested him. At approximately 07:30, Israeli forces accompanied with 8 military bulldozers moved about 100 meters into the southeastern side of Beit Hanoun village in the northern Gaza Strip. The bulldozers leveled and combed lands that were leveled before amidst Israeli shooting. As a result, the farmers, who were in their lands, left the area fearing for their lives, but neither casualties nor material damage were reported. At approximately 09:15, Israeli forces stationed in military watchtowers, east of al- Shuhadaa’ Cemetery, east of Jabalia in the northern Gaza Strip, opened fire at the area adjacent to the border fence between the Gaza Strip and Israel. As a result, Civilians living in houses near the area, panicked, but neither casualties nor material damage were reported. At approximately 06:30, Israeli gunboats stationed offshore, northwest of Beit Lahia village in the northern Gaza Strip, opened fire at Palestinian fishing boats sailing within 3 nautical miles and chased them. The shooting sporadically continued until at approximately 11:00. As a result, the fishermen were forced to flee fearing for their lives, but neither casualties nor material damage were reported. Note: During the aforementioned day, Israeli forces conducted (5) incursions in the following areas and no arrests were reported: Dura, al-Koum, Beit Marsam and Sa’ir villages in Hebron, and Barta’ah eastern village, southwest of Jenin. At approximately 19:00 on Saturday, 22 July 2017, the PRCS was informed of a wounded civilian in Bzaiq area, northeast of Tubas. An ambulance headed to the area, which is a remote area, and found a child under a tree and wounded to the hands and sustained shrapnel wounds to the head and throughout his body, particularly the upper part. The child arrived as a dead body at Tubas Turkish Hospital. The child was identified as ‘Odai ‘Aziz Nawaj’ah (17) from Yatta, south of Hebron. Nawaj’ah lived with his family in Bzaiq plains. He was grazing sheep in the area where he was wounded due to the explosion of a suspicious object from the Israeli forces’ remnants. It should be noted that the Israeli forces is used to training in the abovementioned area and several similar incidents happened before. Following the Friday prayer, residents of Beit Ummer village, north of Hebron, organized a peaceful protest against the Israeli security procedures in Jerusalem after they established metal detectors at the entrances to al-Aqsa Mosque. They approached the entrance to the village where the Israeli forces established a military checkpoint and there was a large force deployed in the area. The protestors threw stones at the soldiers, who fired live bullets, rubber-coated metal bullets, sound bombs and tear gas canisters at them and chased them between houses. They also set up ambushes in the area to arrest the protestors. They arrested Mohammed Thyab Sabarnah (19) after they chased him and took him to the checkpoint established at the entrance to the village. They then transferred him to an unknown destination. At approximately 17:00, dozens of Palestinian civilians made their way from the center of Qalqiliyah towards the northern entrance to the northern checkpoint “Eyal” checkpoint where the Israeli forces ara stationed. When they approached the checkpoint, the Israeli forces fired rubber-coated metal bullets, sound bombs and tear gas canisters at them. They also arrested 3 children namely Khaled Na’el ‘Oudah Nazal (16), Hamzah Yusuf Ja’idi (17) and Yahiya Mohammed Abu Shehab (17). At approximately 18:00 on Sunday, 23 July 2017, Palestinian civilians organized a protest from the center of Joyous village, northeast of Qalqiliyah. They made their way towards the annexation wall, west of the village, and chanted slogans supporting al-Aqsa Mosque. The Israeli soldiers stationed at the abovementioned wall fired live bullets, sound bombs and tear gas canisters at them. As a result, Mahmoud Mohammed Isma’il Qadoumi (14) sustained 2 live bullet wounds to the left thigh and right leg and was arrested. The PRCS crews were not able to offer medical treatment for him. The civilians, who were in the area, including Mohammed’s father, attempted to offer him first aid. However, a soldier pointed out his weapon at Mohammed’s father and threatened him to move away. Mohammed was arrested and transferred via an Israeli ambulance to an unknown destination. His family was informed later that he underwent a medical surgery in “Meir” Medical Center. The surgery continued from approximately 21:00 on the same day to approximately 05:00 on Monday, 24 July 2017. Moreover, Ahmed Fehmi Salim (60) sustained a metal bullet wound to the right hand. On Sunday, 16 July 2017, Israeli forces allowed the exportation of 21.3 tons of tomatoes; 4.8 tons of sweet peppers; 8.8 tons of sweet peppers; and 21.4 tons of cucumbers. On Monday, 17 July 2017, Israeli forces allowed the exportation of 3 truckloads of vegetables; 2 truckloads of tomatoes; a truckload of clothes; a truckload of fish; and 2truckloads of Aluminum scrap. On Tuesday, 18 July 2017, Israeli forces allowed the exportation a truckload of tomatoes; a truckload of garlics and a truckload of furniture. On Wednesday, 19 July 2017, Israeli forces allowed the exportation of 23.3 tons of tomatoes; 0.8 tons of eggplants; 21.4 tons of cucumbers; and 9 tons of peppers. On Thursday, 20 July 2017, Israeli forces allowed the exportation of 5 tons of sweet peppers; 33.9 tons of cucumbers; 0.64 tons of sweet potatoes; and 0.8 tons of fish. On Sunday, 23 July 2017, Israeli forces allowed the exportation of 9 truckloads of vegetables. On Monday, 24 July 2017, Israeli forces allowed the exportation of 2 truckloads of vegetables and a truckload of fish. PCHR apologizes for not publishing the date relevant to Beit Hanoun (Erez) crossing because it was not prepared by the competent authority at the crossing. Hebron: Israeli forces established (23) checkpoints all over the city. On Thursday, 20 July 2017, Israeli forces established 2 checkpoints at the entrance to Ethna village and at the northern entrance to Halhoul village. On Friday, 21 July 2017, Israeli forces established 4 checkpoints at the entrance to al-Fawar refugee camp and al-‘Aroub refugee camp; at the southern entrance to Hebron and at the entrance to al-Shayyoukh village. .
On Saturday, 22 July 2017, Israeli forces established 4 checkpoints at the entrance to al-‘Aroub refugee camp; at the entrances to Deir Razzah and Ethna villages and at the eastern entrance to Dura village. On Sunday, 23 July 2017, 2 similar checkpoints were established at the southern entrance to Hebron and at the entrance to Beit ‘Aynoun village. On Monday, 24 July 2017, Israeli forces established 4 checkpoints at the eastern entrance to Dura village, at the entrances to Beit Ummer and Ethna villages and at the entrance to al-Fawar refugee camp. On Tuesday, 25 July 2017, 5 similar checkpoints were established at the northern entrance to Dura village; at the eastern entrance to Dura village; at the entrances to al-Fawar refugee camp and al-‘Aroub refugee camps and at the entrance to Beit Ummer village. On Wednesday, 26 July 2017, Israeli forces established 2 checkpoints at the southern entrance to Halhoul village and at the entrance to Sa’ir village. Qalqiliyia: Israeli forces established (9) checkpoints all over the city. At approximately 09:15 on Thursday, 20 July 2017, Israeli forces established a checkpoint at the entrance to ‘Azoun village, east of Qalqiliyia. On Friday, 21 July 2017, Israeli forces established 3 checkpoints at the eastern entrance to Qalqilyia ( was established twice); and at the entrance to ‘Azoun village, east of the city. On Saturday, 22 July 2017, Israeli forces established 3 checkpoints under the bridge of ‘Azoun village, leading to Jayyous village; between ‘Azoun and Kafur Thulth village; and at the northern entrance to ‘Azoun village, east of Qalqiliyia. At approximately 03:15 on Monday, 24 July 2017, a similar checkpoint was established at the entrance to Amateen village, northeast of the city. Salfit: Israeli forces established (5) checkpoints all over the city. At approximately 08:40 on Friday, 21 July 2017, Israeli forces established a checkpoint at the northern entrance to Salfit. At approximately 12:30, a similar checkpoint was established under the bridge of Askaka village, east of the city. On Saturday, 22 July 2017, Israeli forces established 3 checkpoints at the northern entrance to Salfit; at the entrance to Deir Balout village, west of the city; on the road between Kaful Hares and Hares villages, north of the city. At approximately 17:30 on Friday, 21 July 2017, Israeli forces established a checkpoint at the northern entrance to ‘Azoun village, east of Qalqiliyia. They searched Palestinian vehicles, questioned the passengers and checked their IDs. In the meantime, they arrested Mo’min Hisham ‘Odwan (28) and Husam Yunis Saleem (22). At approximately 20:00 on Friday, Israeli forces established a checkpoint at the southern entrance to Jenin. They searched Palestinian vehicles, questioned the passengers and checked their IDs. In the meantime, they arrested Abed al-Raheem Fakhri Ghawadrah (21), from Beir al-Basha village, south of the city. At approximately 11:00 on Saturday, 22 July 2017, Israel forces stationed at Abu al-Reesh military checkpoint, in the southern area of Hebron, arrested Hazem Mohamed Abed al-Fatah Zablah (17). At approximately 14:00 on Saturday, a force of Israeli soldiers stopped a Palestinian vehicle at the entrance to Bani Na’iem village, east of Hebron. They checked the passengers’ IDs and arrested Safa Abdullah Manasrah (23). At approximately 15:00 on Monday, 24 July 2017, Israeli forces established a checkpoint on Nablus-Tubas road, northeast of Nablus. They stopped Palestinian vehicles and checked passengers IDs. In the meantime, they arrested Moahmed Nidal Mansour (21), while he was returning from his work to his house in al-Far’ah refugee camp, south of Tubas city. At approximately 19:00 on Monday, a group of Palestinian young men were present at the entrance to Salem camp, west of Jenin, waiting for the release of a prisoner. In the meantime, Israeli forces arrested Anas al-Ghoul (22), from Jenin camp, west of the city. At approximately 20:00 on Monday, Israeli forces stationed at Hawarah military checkpoint, south of Nablus, arrested Ammar Mit’ab al-Tirawi (23), from the city. Eyewitnesses stated that the Israeli forces stopped a vehicle carrying ‘Ammar and ordered him to step out before arresting him. At approximately 07:30 on Tuesday, 25 July 2017, Israeli forces established a checkpoint at the entrance to Bi’lin village, west of Ramallah. They stopped Palestinian vehicles and checked passengers’ IDs. In the meantime, the Israeli forces arrested Abdullah Abu Rahma (46) while heading to his work. Abdullah’s brother, Ratib Abu Rahma, stated that the Israeli forces stopped his brother, confiscated his vehicle and then took him to an unknown destination. It should be noted that Abdullah is the Coordinator of the Popular Committee against the Annexation Wall and Settlements. At approximately 14:00 on Tuesday, Israeli forces arrested Guevara Ma’an al-Namoura (24), a member of the Yatta Youth Club, from Dura city, southwest of Hebron. He was arrested while passing through a military checkpoint near Taqou’ village, east of Bethlehem. At approximately 10:00 on Thursday, 20 July 2017, a demonstration started from Jerusalem’s Old City towards al-‘Asbat Gate. Hundreds of Palestinian young men participated in the demonstration to protest at installing metal detectors at al-Aqsa Mosque entrances and performed noon prayer there. They also continued their protest until the evening. Israeli forces attempted to assault the protesters several time and hit them with batons, but the protesters insisted on staying there. Before al-Maghrib prayer, thousands of Palestinian worshipers arrived in the vicinity of al-‘Asbat Gate to perform prayers. Moreover, before al-‘Isha prayer, the Israeli forces fired sound bombs and rubber-coated metal bullets at the protesters and forcibly dispersed them. A group of Palestinian young men remained in the area in spite of the indiscriminate suppression against them. As a result, around 79 Palestinian worshipers were pushed and hit and sustained bruises as a result. Mohamed al-Fetyani, a paramedic and the PRCS spokesperson in Jerusalem, stated that the PRCS crews treated around 79 persons, who were exposed to the Israeli suppression at al-‘Asbat Gate between al-Maghrib and al-‘Isha prayers. Forty two of those wounded were treated on the spot while 37 cases were referred to the hospital. Three cases ranged between moderate and serious. Following Friday prayer, on 21 July 2017, violent clashes erupted between Palestinian worshipers and Israeli forces in occupied East Jerusalem’s neighbourhoods and villages. The clashes continued until the evening. As a result, 3 Palestinian civilians, including 2 children, were killed. One of the victims was killed by an Israeli settler. PRCS crews stated that around 84 Palestinian civilians were wounded, 11 of them were hit with live bullets and 73 others were hit with rubber-coated metal bullets. In Ras al-‘Amoud neighbourhood, east of occupied Jerusalem, thousands of Palestinian worshipers performed the Friday prayer on the street at the entrance to the neighbourhood. Following the prayer, Israeli forces fired sound bombs and rubber-coated metal bullets at the worshipers and then dispersed them. Confrontations erupted in the neighbourhood and then reached near the entrance to “Ma’aleh Zeitim” settlement, in the center of Ras al-‘Amoud neighbourhood. According to PCHR’s investigations and eyewitnesses’ statements, an Israeli settler, who lives in the “Ma’aleh Zeitim” settlement, chased a group of Palestinian civilians while he was present at the entrance to the settlement. In the meantime, the Israeli settler topped one of the settlement walls and then opened fire at Mohamed Mahmoud Dawoud Sharaf (17). Mohamed was hit with 2 bullets to the neck. The Palestinian youngsters attempted to help Mohamed, but he succumbed to his wounds before arriving at the medical center. It should be noted that Mohamed has just celebrated his high school (Tawjihi) graduation and was planning to join the university and complete his study. In al-Tour neighbourhood, east of occupied Jerusalem, violent clashes erupted between Palestinian worshipers and Israeli forces at the neighborhood intersection. The Israeli forces fired live bullets towards the worshipers. As a result, Mohamed Hasan Abu Ghannam (20) was wounded. Eyewitnesses stated that the Israeli forces opened fire at Mohamed from a close range. Mohamed’s father also said that the bullets penetrated Mohamed’s chest and heart and killed him as a result. After that, Mohamed was taken to al-Maqased Hospital to receive medical treatment. In the meantime, the Israeli forces raided the hospital and heavily fired sound bombs in the hospital yards. They also attempted to arrest Mohamed. When medical sources declared the death of Mohamed, a number of Palestinian young men smuggled his corpse out of the hospital and buried his corpse in al-Tour cemetery. In addition, Mohamed’s mother said that she could not bid farewell to her son because of the Israeli forces, who attempted to take his corpse from the hospital. According to PCHR’s investigations about the killing of Mohamed Abu Ghannam, at approximately 15:00, Mohamed arrived at the emergency department at al-Maqased Hospital. Mohamed was hit with a live bullet to the chest and his health condition was serious. According to medical sources, Mohamed suffered from a severe bleeding and he fell into a coma. Therefore, the medical crew offered first aid to him and tried to revive his heart. It should be noted that the electrocardiogram showed that he was still alive. Twenty minutes later, the medical crew decided to take Mohamed to the surgery’s section, where Mohamed was given blood units. Furthermore, Mohamed was accompanied by three nurses from the emergency department, an anesthesiologist, and another specialist from thoracic surgery. He was then put on a bed and taken to the corridor leading to the electric elevator. When Mohamed and medical crew arrived at the blood bank, a force of Border Police officers deployed in the corridor leading to the elevator and pointed their firearms at the Palestinian young men gathered in the blood bank. The Border Police officers attempted to deny Mohamed’s bed access to the elevator and during which they attacked a nurse, Raied Ibrahim Mubarak (25), hit him in the neck and pushed him on the ground. The Border Police officers also attacked the doctors and then removed the artificial oxygen device and blood units from Mohamed’s body. After that, a number of Palestinian young men immediately carried Mohamed and quickly took him to the X-ray room to which the doctors followed them. The Palestinian young men closed the door of the X-ray room so that the Border Guard officers would not catch them. The doctors tried to revive his heart, but he succumbed to his wounds. Wadi al-Jouz neighborhood, east of occupied Jerusalem’s Old City, witnessed violent clashes between hundreds of Palestinian young men and Israeli forces. The Israeli forces fired rubber-coated metal bullets, tear gas canisters and sound bombs at the protesters. Additionally, the Israeli soldiers sprayed wastewater at the protesters. A group of undercover units also indiscriminately fired live bullets in the area and attacked dozens of youngsters by hitting and pushing them. As a result, the Palestinian youngsters sustained bruises and various wounds. Eyewitnesses stated that the Israeli undercover units raided al-Takrory grocery and a parking lot, where they arrested many persons. Mohamed Mahmoud, a lawyer, stated that the Israeli forces arrested 8 civilians, including a child, from Wadi al-Jouz neighborhood. The arrested persons were identified as Hasan Waheeb Yehia al-‘Ajlouni (15), Sa’d Sa’eed Kayaneih (19), Ibrahim Khalil Abu ‘Arafa (28), Suhaib ‘Adli Abu Sinanah (28), Loai Faraj ‘Eid Jaber (18), Ameer Rafeeq Ghaith (20), Ahmed ‘Adli ‘Ashour (23) and Mo’taz Sa’iadah (23). In the afternoon, thousands of Palestinian worshipers performed the Friday prayer on street at Qalandia military checkpoint, north of occupied Jerusalem. They performed the prayer in response to calls from the Ministry of Islamic Endowments (Awqaf), Islamic religious figures and national powers. Israeli forces were widely deployed around the checkpoint and called for backups to deny the worshipers’ access to Jerusalem. Following the Friday prayer, the Israeli forces fired live bullets, rubber-coated metal bullets and sound bombs to disperse the worshipers. As a result, 17 civilians, including 5 children, were wounded. Six of them were hit with live bullets and 11 others were hit with metal bullets. On Saturday, 22 July 2017, Israeli soldiers forcibly dispersed thousands of Palestinian worshipers while they were present at al-‘Asbat and al-Majles Gates. The Israeli forces attempted to prevent the worshipers from staying in the area and fired sound bombs and rubber-coated metal bullets at them. They also sprayed wastewater at the worshipers. PRCS stated that around 63 Palestinian civilians were hit with metal bullets in al-‘Asbat Gate area and sustained shrapnel wounds. Moreover, Silwan, al-‘Isawiyia, al-Tour, Wad al-Jouz, al-‘Ezariyia, and Abu Deis villages, in addition to al-Fawar refugee camp and Qalandia refugee camp witnessed clashes between the Israeli forces and Palestinian young men. As a result, 29 civilians were hit with metal bullets. On Sunday, 23 July 2017, Israeli forces fired sound bombs at Palestinian worshipers in al-‘Asbat Gate area in order to disperse them. They also arrested Ahmed al-Shawish after hitting him. In the meantime, hundreds of Palestinian worshipers were present in the area and then were able to perform al-Maghrib prayer at Hitah Gate entrance. Outside al-‘Asbat Gate, the Israeli forces fired sound bombs and rubber-coated metal bullets at the worshipers following al-‘Isha prayer after forcibly dispersing them. The Israeli forces then chased the worshipers into Wadi al-Jouz neighborhood. According to PRCS crews, 15 Palestinian civilians were hit with metal bullets, 4 of them were taken to the hospital while the others were treated on the spot. On Friday, 21 July 2017, Israeli forces tightly cordoned off al-Aqsa Mosque and occupied Jerusalem’s Old City, in coincidence with the Israeli Cabinet’s decision to keep installing the metal detectors at al-Aqsa Mosque gates. The Israeli forces also erected metal barriers at the intersections of roads adjacent to the Old City. Additionally, they installed metal barriers at the entrance to al-Asbat Gate (Lions Gate) and on the road leading to it. Moreover, the Israeli forces declared in a statement that they imposed restrictions on the Palestinian Muslim worshipers entering Jerusalem’s Old City and al-Aqsa Mosque, as men below 50 are denied access to the Mosque. Since early morning on the abovementioned day, Israeli forces fixed more barriers at the entrances to villages and neighborhoods in occupied Jerusalem, especially those surrounding the Old City. They erected barriers on all main streets to stop buses driving Muslim worshippers from Israel in order to prevent them from entering Jerusalem. The Israeli police was supported by five Israeli army brigades that were deployed in Jerusalem’s suburbs, besides, military preparedness throughout the West Bank was announced. In response to these updates, the Islamic Endowments (Awqaf) Department issued a decision to close all mosques across occupied Jerusalem and demanded the worshipers to perform the Friday prayer at the al-Aqsa Mosque gates in rejection of the metal detectors. The Islamic leaders and patriot powers called for heading to al-Aqsa Mosque instead of mosques around. As a result, the worshipers gathered and closed the streets during al-Fajr (Dawn) prayer. They did the same during the Friday prayer, as dozens of thousands of Palestinians performed the Friday prayer in occupied Jerusalem. Some of them were able to reach al-Aqsa gates, while the biggest number of them performed the prayer outside the city gates. Wad al-Jouz neighborhood, Saladin Street, Hebron Gate, al-Sowana, al-Amoud (Damascus) Gate and Ras al-Amoud area witnessed prayers performed by tens of thousands. On Sunday, 23 July 2017, Israeli forces fixed, in addition to the metal detectors, surveillance cameras, bridges and metal stands at al-Asbat (Lions) Gate. However, the Palestinians continued their sit-ins and prayers at the gates, rejecting the metal detectors. They performed the five prayers at al-Asbat and al-Majles gates’ entrances. Besides, they performed the funeral prayer over a Jerusalemite’s corpse at the entrance to al-Aqsa Mosque as his family refused to enter through the metal detectors. The head of the Israeli municipality toured in al-Asbat area while Israeli officers toured throughout al-Aqsa mosque gates. At approximately 01:00 on Tuesday, 25 July 2017, the Israeli authorities dismantled the metal detectors established at al-Asbat, al-Majles, al-Selsela and al-Hadeed Gates, but kept the enclosed metal tunnels at al-Selsela and al-Asbat Gates. They did not also remove the bridge they established at al-Asbat Gate. The Israeli bulldozers levelled the area and removed huge rocks from in there, establishing bridges at all gates of al-Aqsa Mosque, excluding Hetta Gate. The smart cameras will be placed on this bridges. Ofir Gendelman, Israeli Prime Minister Benjamin Netanyahu’s spokesperson, said, “The Security Cabinet has decided to replace the metal detectors with smart and other measures in order to ensure security on the Temple Mount”!! At approximately 10:00 on the same day, the Islamic leaders held a meeting in the Shari’a Court’s head office in Jerusalem and issued a statement confirming the “full rejection of all Israeli measures since 14 July 2017 until now”. The Islamic leaders stressed the importance of opening all gates of al-Aqsa Mosque for all worshipers unconditionally. They added that entering al-Aqsa Mosque will be decided about after the technical committees issue their reports to observe what happened inside and outside al-Aqsa Mosque. Following al-Isha prayer, on Tuesday, 25 July 2017, the Israeli forces accompanied with mounted police attacked the worshipers gathering at al-Asbat Gate inside and outside the Old City walls in Jerusalem, “calling for stopping all measures the Israeli authorities are trying to impose on the worshippers while entering al-Aqsa Mosque. The Israeli forces forcibly pushed the worshippers away from the area and fired sound bombs. They opened fire as well and chased the worshippers in Wad al-Jouz and at the entrance to Silwan village. Moreover, they fired sound bombs at the medical crews and journalists in the scene and prevented them from performing their duty. As a result, Fatima al-Bakry, a volunteer at al-Aqsa Satellite Channel, sustained sound bomb shrapnel wound as the Israeli forces directly targeted her while covering the clshes at al-Asbat Gate. The Israeli forces also arrested journalist Fayez Abu Rmaila after harshly beating him up. PRCS sources stated that 13 persons were wounded as a result of the Israeli suppression of worshippers with sound bombs and rubber-coated metal bullets. Three of the wounded persons were taken to al-Maqased Hospital in al-Tour neighborhood to receive the necessary medical treatment. Lawyer Mohammed Mahmoud said that 5 Palestinian were arrested at al-Asbat Gate: journalist Fayez Hamza Abu Ermaila (25), Isaac Dawood al-Natcha (24), Majdi Ahmed al-Atrash (20), Taher Khaled Idris (22) and Hamza Samer Abu Diab (17). Besides, Ahmed Dawood Ewisat was arrested while walking in Ras al-Amoud neighborhood. At approximately 00:00 on Thursday, 20 July 2017, Israeli forces moved into al-Tour neighborhood, east of occupied Jerusalem. They raided and searched a house belonging to Hazem al-Sayyad and arrested his son Ra’ed (12). At approximately 02:00 on Thursday, Israeli forces moved into al-‘Issawiyia village, northeast of occupied Jerusalem. They raided and searched dozens of houses and arrested 8 civilians, including 5 children. The arrested persons were identified as Anas Ali Abu ‘Asab (16), Qusai Ahmed Dari (16), Nadeem Mohamed al-Safadi (17), Mohamed ‘Izzat ‘Obid (15), Nidal Omar Ghannam al-Faroukh (17), Ahmed Kaiyd Mahmoud (23), Ashraf Jamal ‘Eliyan (19) and Mohamed ‘Esmat ‘Obaid (20). At approximately 03:00, Israeli forces moved into Sho’fat refugee camp, north of occupied Jerusalem. They raided and searched houses from which they arrested Mohamed Abdullah Abu Khadir and Hamza ‘Ajaj. On Friday, 22 July 2017, Israeli forces carried out an arrest campaign against Jerusalemite activists after raiding their houses. Lawyer Mohamed Mahmoud stated that the Israeli forces arrested Hatem Abdul Qadir, Fateh leader in Jerusalem; and ‘Adnan Ghaith, Secretary of Fatah movement in Jerusalem; Amjad Abu Assab, the head of the Jerusalem Committee for Families of Prisoners; Hani Ghaith; Naser ‘Ajaj; Mousa al-‘Abasi; Mohamed Dawoud Abu al-Hawa; Naser al-Hadami and Zuhair Za’aneen. In the evening, Israeli forces arrested 6 civilians from Jerusalem’s Old City. The arrested persons were identified as Mohamed Najeeb, ‘Alaa Najeeb, ‘Obadah Najeeb, Yousef Hazinah, Ibrahim Abu Isninah, and Hamoda Abu Isnienah. At approximately 01:00 on Sunday, 23 July 2017, Israeli forces moved into al-Tour neighbourhood, east of occupied Jerusalem. They raided and searched a house belonging to Tamara Mu’amer Abu Laban (17) and arrested her. Around the same time, Israeli forces moved into Silwan village, south of occupied Jerusalem’s Old City. They raided and searched a house belonging to ‘Alaa Mohamed Rowaidy (16) and arrested her. At approximately 19:00 on Sunday, Israeli froes arrested Mos’ab Ahmed Abu Ghannam (23) after they ran over him while chasing a group of Palestinian young men on the main street in al-Tour village, east of occupied East Jerusalem. Mufeed Abu Ghannam, Head of the follow-up committee in al-Tour village, said that Mufeed was run over by a military jeep and was then arrested. At approximately 01:30 on Monday, 24 July 2017, Israeli forces raided and searched a house belonging to Mohamed Abu Ghannam on al-Jadeed street in al-Tour village, east of occupied East Jerusalem. Mohamed was shot dead by Israeli forces during clashes erupted in the neighbourhood on Friday, 21 July 2017. They arrested Mohamed’s father, Hasan Abu Ghannam ; and his cousin, Isma’il Abu Ghannam. At approximately 09:00 on Thursday, 20 July 2017, Israeli forces accompanied by military vehicles and a Israeli Civil Administration vehicle moved into Beit al-Rosh al-Foqa village, west of Dura, southwest of Hebron. An Israeli Civil Administration officer issued 3 notices to halt construction works and hanged them to the walls of 3 under-constructions buildings. He also took photos of the buildings. The notices were issued against houses belonging to 3 siblings from ‘Ashour family. The abovementioned buildings were built in the beginning of the year. In addition, 3 families comprised of 20 persons, including 14 children, were supposed to live there. These notices were issued under the pretext of non-licensing and the Israeli Civil Administration ordered the families to stop construction. Moreover, the Israeli Civil Administration appointed 10 August 2017 to hold a session for the inspection committee in its office in “Beit Eill” settlement, north of Ramallah. The session will be held in order to look in the demolition notice issued against the building and return the place to its previous state. A 120-square-meter building belongs to Ramzy Huraiby Abdul Qadir Kashour. It was supposed to shelter 4 persons, including 2 children.